More than 1 million people live in this quiet capital. Traditional Khmer and French architecture, the Royal Palace, the Silver Pagoda and the National Museum, are waiting for you. From the Central Market in the north to the Independence Monument, the town centre follows the river where you will see Khmers going for a walk along at nightfall, eating outside with friends or family. 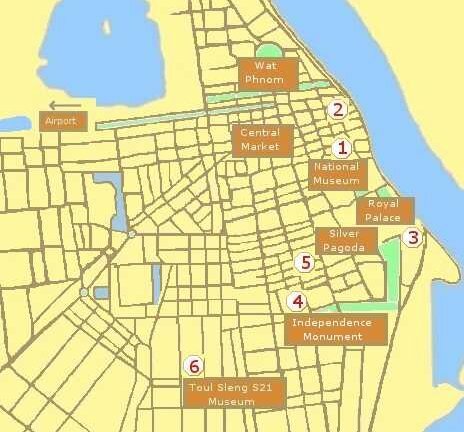 what are you looking for in Phnom Penh ? Air-conditioning, cable TV, in-room safe, mini-bar, private balcony, Swimming pool, Sauna/Spa. Air conditioning, cable TV, mini bar, Wi Fi and Internet. Swimming pool. Air conditioning, cable TV, mini bar, free wi-fi internet access. Swimming pool and rooftop jacuzzi. Beware: the pictures on their website are fake !